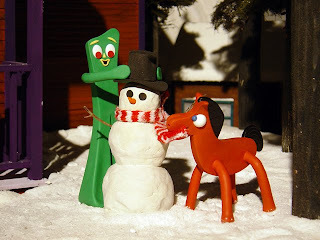 Art Clokey, the creator of kiddie faves Gumby, and Davey & Goliath, died in his sleep last Friday. He was 88. Clokey's Gumby, Pokey, Prickle and Goo -- and the Groobees, and Blockheads -- were my absolute favourite characters as a little kid. I had the set of characters as a 4 year old, carried them everywhere. I'm actually surprised that this sad news wasn't carried via more mainstream news services. I only discovered it on my iPhone this morning. Perhaps kids these days are more interested in the computer tomfoolery that's sold today as cartoon entertainment. It's a shame that animation pioneers such as Clokey seem to be forgotten by some. Much like the works of Rankin/Bass, Art Clokey's stop-motion animation is full of heart, soul and fun. High tech isn't always the best, in my humble opinion. Rest in peace, Mr. Clokey -- and thank you.